crafty caroline: My last sneak peak. Well today's the day that Sheena is back on Create and Craft. So set the record button for 11am!!. This is the last sneak peak I am going to show you before the show. 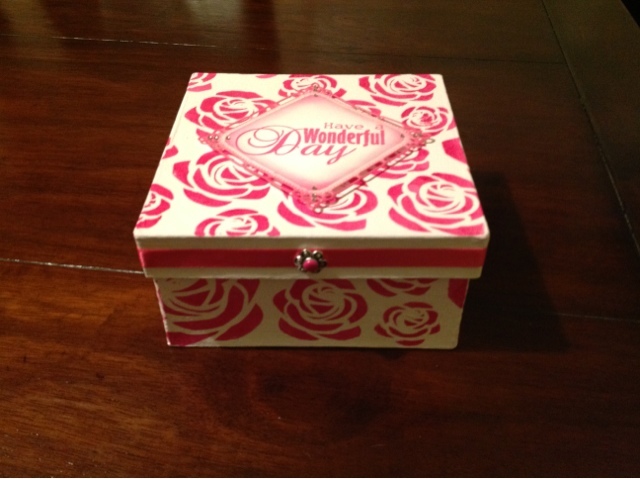 I put a tiny amount of the Pink Azalea Primary Elements into some white emulsion and painted the box. As you can see, a little of the primary elements goes a long way. Once this was completely dry, I mixed up some more of the Pink Azalea, with bind and resist powder and a small amount of water to get a paste and then using an Existencil, I sponged the paint over the stencil to get the pattern onto the box. I used a stamp from the Only Words-Through The Rain stamp set, and then die cut it, distressed the edges of the sentiment, added a few gems, a ribbon around the edge of the box lid, and finally, I added an embellishment to cover the join in the ribbon. Fantastic, love this very much and the colours too.